Newport ~ The Thetford Chamber Singers will present a special evening of literature and song at Goodrich Memorial Library in Newport on April 3 at 7:00 pm. The event, “Poetry and Song,” is part of the Vermont Humanities Council’s First Wednesdays lecture series and is free and open to the public. 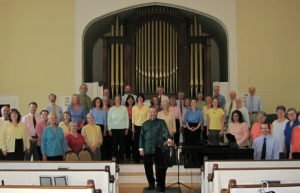 A veteran singing ensemble, The Thetford Chamber Singers will present powerful literary texts with complex choral arrangements, including the work of Wendell Berry, Emily Dickinson, Henry Wadsworth Longfellow, and others. Celebrating its fortieth anniversary last year, the Thetford Chamber Singers (TCS) was organized in the fall of 1978 by founding director Valerie Miller, who led the ensemble until 2011. Singer and composer Kevin Quigley has directed the group since 2012. TCS is an auditioned chorus comprising nearly fifty men and women from a dozen Upper Valley towns. Diverse in age and livelihoods, these performers are drawn together by the joy of singing and a commitment to sharing adventurous, complex, and engaging music with the community. The TCS repertoire is distinguished by the wide variety of musical styles representing varied traditions — from ancient to very contemporary, including commissions by living composers — beautifully woven together with poetry and other recitations to create a multi-layered experience. “Poetry and Song” is underwritten by Vermont College of Fine Arts.